Welcome to the VQA Website! Our website is one of our main means of communication with you as PSET Provider. You should find a lot of information here with regards to your interaction with VQA. If you already are a registered provider, then you are already familiar with many of the VQA processes. But there will be frequent occasions where you need some more information, a detailed procedure description, or a form or other document. And you can find that all here on our website. But if you are not registered yet, then you will find all the information on how to become a registered PSET Provider on the website as well to get you started. Just move your mouse over the "For Providers" text, and the menu will drop down. When you click on any of the menu items, you will be taken to the corresponding page. When you are on one of these pages, most of the time we will show you a menu on the side as well, with "Quick Links". You can use these to quickly jump to other information you are looking for. If the item has a little "+" behind it, there are more links hidden underneath. Click the menu item to reveal them. Here you find a link to all the Policies and Procedures that relate to PSET Providers. VQA has also created a Handbook for the development of courses, that you can use in case you would like to develop a new course. The "Training Packages" menu item gives you access to an overview of all the existing units of competence that VQA has developed. However, to get access to this, we need to know that you are indeed a provider and you need to login first. If you do not have a login yet, please use the Contact Us Form to request one. This will bring up a login form. Note: The login form will be displayed at the top of the page. If you have already scrolled down the page and you click "login" then, you may not see the login form. Please scroll back up to the top of the page to show the form. 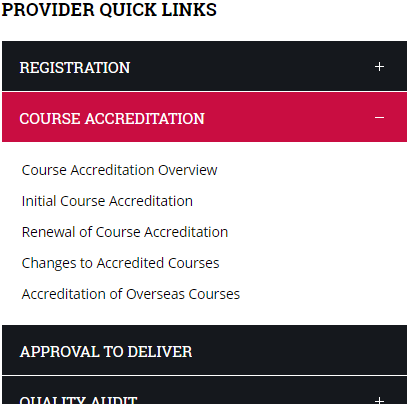 The "Course Components" section has all the detailed information on all the course components, per accredited course. You also need to be logged in as a provider to be able to view and download these. And even then, you will only have access to those packages that VQA has specifically given you access to. If you need access to a course package, please use the Contact Us Form to request this. Note that in general there will be a fee to pay for downloading these course component packages. If you are looking for some information and have a hard time finding it (which we hope we have been able to avoid, but just in case), please use the "Search" button at the top right of the page. This will search through all the articles that are on the website (unfortunately we cannot search inside uploaded documents). Finally, we love to hear from you. Please let us know if you have any issues with the website, or would like to see information on something here that you cannot find. Just get in touch using the Contact Us Form. We hope you find what you are looking for!